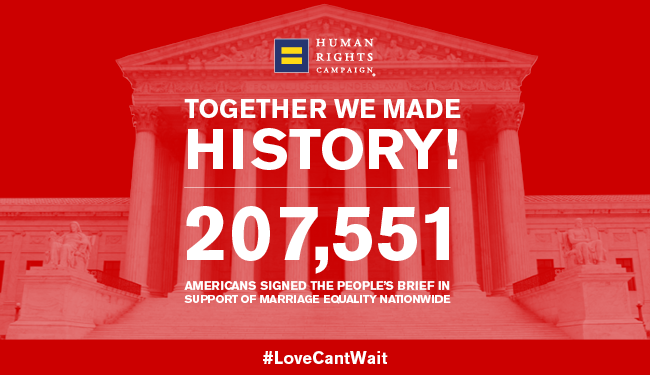 The Human Rights Campaign delivered its historic "People's Brief" -- with 207,551 signatories calling for full nationwide marriage equality -- to the US Supreme Court on Friday, March 6, 2015. 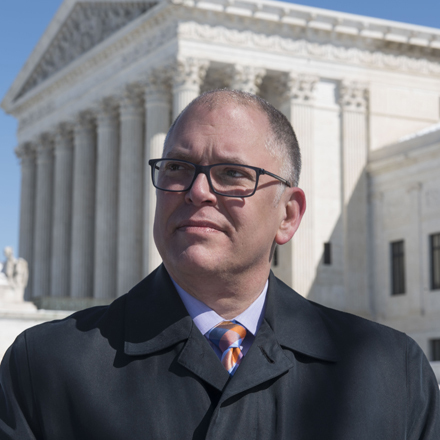 Longtime HRC member Jim Obergefell, the named plaintiff in Obergefell v. Hodges, the marriage equality case set to be heard by the U.S. Supreme Court on April 28, joined HRC to hand-deliver dozens of boxes of briefs. 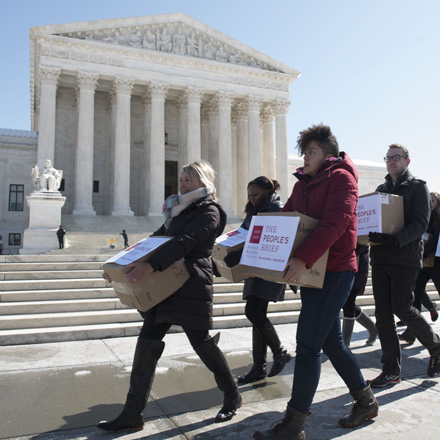 The People’s Brief has more signatories than any amicus brief ever submitted to the Supreme Court. 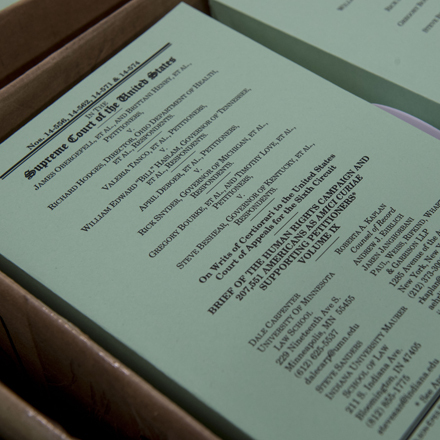 With all of the signatures, each copy of The People’s Brief is approximately 3,500 pages long, for a total of approximately 175,000 pages. It required four days of round-the-clock printing in order to complete the 50 copies required by the Court in time for the March 6 deadline for amicus briefs. Nineteen boxes were delivered to the Court. Read the full text of The People's Brief, a joint effort by the Human Rights Campaign, the nation's largest lesbian, gay, bisexual and transgender civil rights organization, and Roberta Kaplan, the acclaimed civil rights attorney who famously advocated on behalf of marriage equality in U.S. v. Windsor in 2013*. Times can blind us to certain truths,” Supreme Court Justice Anthony Kennedy wrote in a major 2003 LGBT rights opinion, “later generations can see that laws once thought necessary and proper in fact only serve to oppress. When laws and constitutional amendments banning marriage equality were passed, many voters and legislators really were blinded by the times. They did not realize that they knew LGBT people personally. They did not recognize the contributions that LGBT people and their families make—as employees, as neighbors, as part of the social fabric in every community in America. Some saw the LGBT community as strangers, not as people with the same hopes and dreams as anyone else. In other words, the laws challenged in this case are more than fundamentally unfair. They were also adopted in at a time that utterly failed to take into account LGBT Americans as individuals deserving of dignity. The Court has recognized that dignity throughout its history—most recently in U.S. v. Windsor. But recognizing that dignity isn’t enough. It’s time to leave the blindness of the past behind, and guarantee the equal protection our constitution promises to every American. The Human Rights Campaign, the nation’s largest lesbian, gay, bisexual and transgender (LGBT) civil rights organization, and Roberta Kaplan, the leading civil rights litigator who famously argued U.S. v. Windsor before the U.S. Supreme Court in 2013, launched this unprecedented "People’s Brief" on marriage equality to the Court. As the nine Justices prepare to hear oral arguments in four critical marriage equality cases this spring, The People’s Brief marks the first time that tens of thousands of fair-minded Americans will have the opportunity to have their voices formally heard in a civil rights case of this magnitude. Americans who are LGBT or have LGBT friends, family members, and colleagues can review the content of the brief, and affix their name to a document that will be considered by the highest court in the land.